Not long ago I wrote a short post about MC carts and the noise contribution of tubes when amplifying such tiny signals. I focused on step-up transformers as the solution to noiseless amplification, but there is another approach. 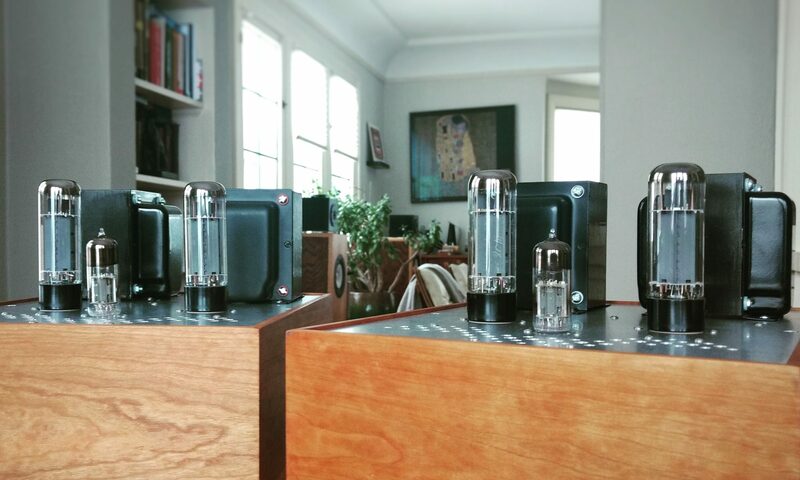 If you don’t like solid state, stop reading. Ok, now that you stopped reading and checked out the going prices for step-up transformers, you’re back. Good. Don’t worry, this approach uses the tubeyist solid-state device: the JFET. A cascode is a compound amplifier in a totem pole arrangement. Here’s a great explanation by Valve Wizard Merlin. This allows you to achieve huge amounts of voltage amplification with fairly economic current usage and without coupling capacitors or multiple phase inversions. The driving force in this arrangement is the transconductance of the lower tube. The lower tube and upper tube do not need to be the same, nor do they even need to be the same type of device. JFETs (junction gate field effect transistors) are voltage controlled devices, just like tubes. In fact, they bias in a very similar way: Rsource in the above raises the n-type JFET’s source voltage above the gate, similar to the way a cathode resistor in a grounded cathode amplifier raises the cathode above the grid. On the other hand, even the lowliest JFETs have a higher transconductance (gm) than the mightiest small-signal tubes. Icing on the cake is that JFETs, properly chosen and cared for, are lower noise devices. As such, they make a great lower device in a hybrid cascode. Rp and Mu are characteristics of the tube upper device. The choice of upper device affects how much of the voltage gain is performed by the JFET by affecting the load it sees. A high Mu and low Rp upper tube (i.e. high transconductance) presents a lower load as divided down at its cathode, thus less voltage amplification by the JFET (and more voltage amplification made up by the tube due to the higher Mu). A low transconductance upper tube does the opposite. But regardless of the tube (assuming an appropriately sized Rload), the overall gain remains the same: ultimately the transconductance of the JFET multiplied by the load on the upper tube. So where’s this headed? Obviously there’s a full design coming to try out this idea, but the takeaway is that a hybrid cascode is potentially a great way to step up the tiny signals from a moving coil cartridge with very low noise and hand the now-larger signal off to a tube amplification stage without multiple supply voltages, coupling caps, or an expensive step up transformer. The catch? Cascodes have poor power supply noise rejection and a fairly high output impedance. But there are ways to minimize these factors, too.